The Samsung Galaxy S4 LTE-A edition with the Snapdragon 800 chip inside is understandable getting the attention of all benchmark-loving geeks. The smartphone was already put through its paces in a couple of benchmarks last week, but today, another batch of benchmarks has surfaced showing what the Adreno 320 GPU is capable of. 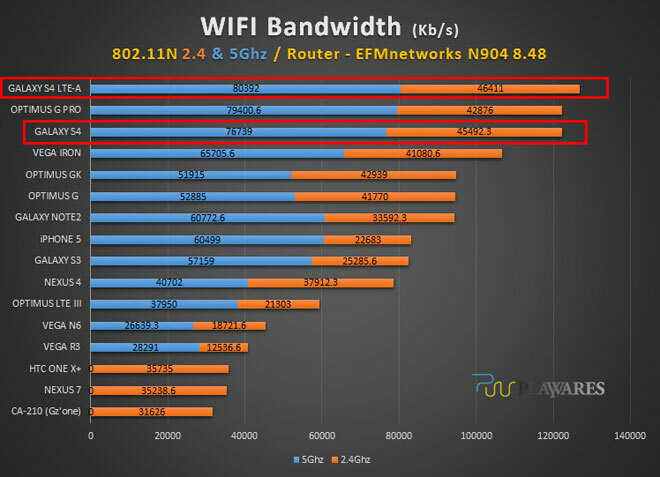 The benchmarks that were used are GFX Bench 2.7, Epic Citadel, AnTuTu 3D, and 3DMark benchmark, The Wi-Fi adapter in the phone was put through some testing as well to see if supports higher speeds than its Snapdragon 600 and Octa variations. But now onto the benchmark scores, which were provided as screenshots of chart tables. However, we’ve converted them to our trusty benchmark graphs. Starting off with the AnTuTu 3D Rating benchmark, the Samsung Galaxy S4 LTE-A is the definite winner among Android smartphones, but is far behind the iPhone 5, which scores north of 13000 points. That’s unsurprising though, as the first run is of the actual resolution of the respective smartphone. Since the iPhone 5′s resolution is much lower than the one of the Galaxy S4, it’s normal for Apple’s smartphone to take that one. However, when it comes to offscreen benchmarking, the Adreno 320 takes the lead of the iPhone 5, but still loses to the Octa version of the Galaxy S4. Moving onto the 3DMark benchmark test, the Galaxy S4 is on top with 17075 points for the graphics score on the “Icestorm Detail” level. Lastly, there’s Epic Citadel. There, the Galaxy S4 LTE-A falls behind the Galaxy S4 Octa yet again, but it’s more to do with the fact that the benchmark runs onscreen and the devices hit the 60 fps limit of their displays. And finally, we get on to the Wi-Fi Bandwidth test. 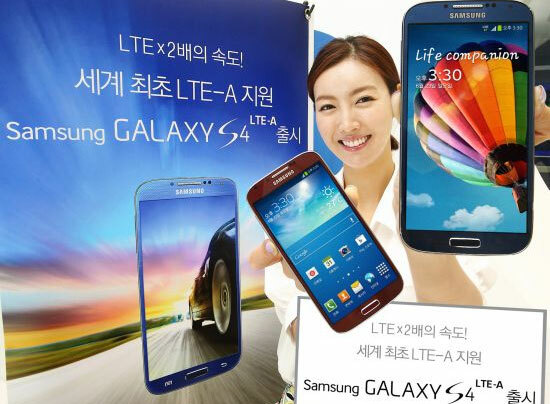 The Galaxy S4 LTE-A sits on top scoring 80392 points on the 5GHz band and 46411 on the 2.4GHz band. The Octa core variety gets 76739 points and 45492 points on the 5GHz and 2.4GHz band, respectively.